Queensland mechanical engineer Mark Henry had the professional chef in mind when, as a student, he set about developing a range of knives that were supremely functional and of such quality that they could withstand the rigours of Australia's busiest restaurants. They became so popular with chefs, they are now sought by home cooks as well. “I developed the knives for working pro chefs,” recalls Mark. “As a young student with no commercial experience, I had no idea about retail. I just wanted to redefine the working chef’s knife and eliminate all those traditional old weaknesses. Most professional knives are produced in Europe, but Mark wanted to design a knife range that totally re-shaped the category. His first idea was to use high carbon Japanese stainless steel, noted for its superior durability and ease of sharpening. For the best combination of sharpness and toughness, Mark specified the blade be between the thick, strong European style and the sharp, light Japanese style. The next crucial element was in the seamless construction. The blade and the handle are one, so there is no place for food to get trapped, and no rivets or plastic parts to fail. So not only does it look stylish, it is the ultimate in food hygiene and durability. “I thought it was a bit silly that after 800 years of chef knife making, in the ‘90s we still had the same riveted handles, sometimes still with the same type of wood ‘scales’, or plastic more recently,” says Mark. “My chef friends and I all had knives with handles that had split wood, lots of gunk in the gaps, rivets missing, melted plastic, etc. I worked on a way to make the blade and handle into one seamless piece, while still keeping a hollow cavity in the handle for the correct balance. “Nothing beats this construction for hygiene and durability, particularly when combined with our tough steel and strong blades. What also raises Füri above its competitors is its innovative handle design. The iconic reverse wedge shape means the handle locks into the hand for a safer grip, which helps reduce hand fatigue, and reduces repetitive strain injuries. “While I was still at university (QUT) studying my mech engineering degree, I put some research into the forces involved during the most repetitive and heavy cutting motions chefs use,” explains Mark. “It became quickly evident, to me, that the traditional handle shape (basically the same for 800 years) was opposite to what it should be. The traditional taper which becomes narrower toward the handle actually encourages hand slip toward the blade. Then I realized why nobody cut themselves, even with wet/oily hands: the brain automatically compensates for any small slip by making the hand squeeze tighter on the handle to produce more friction and grip. 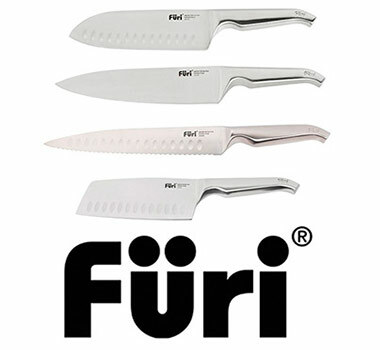 Füri’s innovative design elements and materials result in knives of the utmost quality and are the reasons Füri is the knife of choice for chefs around the world. 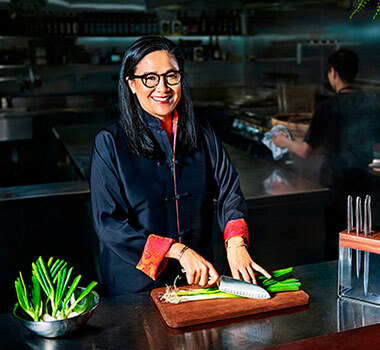 TV chef and restaurateur Kylie Kwong is a Füri brand ambassador, while Nigella Lawson is also a big fan.